Here we all are, still out there, writing, searching, gathering our courage and trying new things. Kathy had her spot of hiding under the kitchen table; I always called mine, “the corner”—the spot where I’d retreat in uncertainty (despair?) when not quite being good enough clobbered me once more. But having students—how about “colleagues” or “neighbors” or “fellow strivers”—turned out to be an arena where the challenges remained energizing, not demoralizing. And it’s still all about practice—writing, writing, and writing. Yes, yes, and yes. I cannot imagine you feeling like your writing is not good enough. Are you saying this dreaded feeling never actually goes away, even after a person has been given the precious miracle of publication? And guides and affirms so many on-line fledglings? So are you saying you are one of us? When you get tired of looking at the walls of your corner, come on over (under). The table allows for more than one wounded writer. “This dreaded feeling” of doubt certainly diminishes with time, but we’re all subject to its attack. This is our human nature. No matter what the level of our skill in any field, we always look around and see that the grass is greener across the street, that we are not as good as we’d like to be, that satisfaction is only a place to pause. If we were not built this way, we would still be living in trees. For this reason, I always fall back on the idea of writing as practice. Tiger Woods, the knife thrower in the circus, and Itzhak Perlman all practice hours per day. Yet I’m sure that even these highly skilled professionals all have moments when they’d appreciate that invitation to hide out under your table for a bit. But we keep going. “…satisfaction is only a place to pause” and “But we keep going” is now on my wall above my computer. and flood my eyes with unseen light. on bended knees I persevere. I dare not halt; I dare not rest. to underscore the need for haste. whose bounty could my soul sustain. my muse doth hide in secret lair? 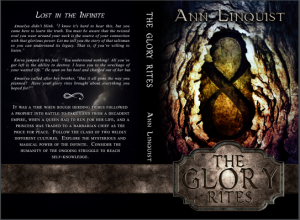 Gullie, What I find so interesting here–introductory words included–is the overlap between you and your muse. Sometimes she’s you; sometimes she’s an “other” who needs luring and also protection. Loved your rhymes. Hi Ann! I don’t know if you remember me, but I took your creative writing class. I’m glad to see that you’re blogging. I’ll definitely be checking back. This looks fun! Just Jean–Yes, I do remember you (mitered edges!). Feel free to try goofing around! My hunch is you will surprise yourself.